Pennsylvania is a big state with many mattress shops. We’ve narrowed down some of the best so that your night’s sleep is sure to get better. Whether you live in quiet Amish Country, or the bustling streets of Philadelphia, you’ll need a good night sleep at the end of a busy day. Pennsylvania offers mattresses as diverse as the state itself including organic, eco-friendly, and all of the name brands you have come to recognize. We spend ? of our lives on our mattresses, so purchasing the right fit is a big deal. Below you will find mattress shops that span the state of Pennsylvania. If you are looking for a mattress that is affordable, high quality, and the perfect fit for your sleep style, check out the mattress stores below. If you’re wondering “where can I find a mattress in Pittsburgh?” then you’re in the right spot. Pittsburgh, like many large cities, has a number of options that are neighborhood-specific. Mattress Warehouse is located downtown (4100 William Penn Highway) and offers all of the name brand mattresses you would hope to find for discounted and affordable prices. In addition to the convenient downtown location, Mattress Warehouse offers affordable mattresses, knowledgeable staff, and top-notch customer service. When in Shady Side, make the trip to Levin Mattress. Levin Mattress offers high-quality customer service that includes a mattress fitting that tailors your mattress to fit your sleeping habits. Mattress Firm does an excellent job providing quality mattresses conveniently located in the various regions of the city. If you’re looking for a mattress in the East Side neighborhood, try Mattress Firm Village (6401 Penn Ave.). There are additional locations in Robinson (221 Summit Park Dr.) and North Hills (7203 McKnight Rd.). Sleep Pittsburgh is a fantastic option for any individual looking for a mattress near Pittsburgh. Sleep Pittsburgh is located in Homestead (401 E. 8th Ave) and offers quality customer service and a knowledgeable staff. 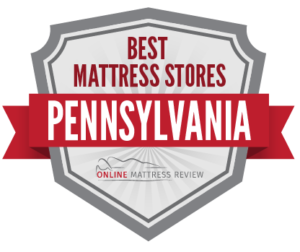 Looking for a mattress store near Harrisburg? Try Mattress Warehouse. Mattress Warehouse provides a wide-range of mattresses, box springs, and pillows that won’t break the bank. You should expect to find affordable mattresses, an extremely knowledgable staff, and convenient and clear shipping as well as return policies. Mattress Warehouse is king in Harrisburg and has several locations including on Paxton Street (3350-A Paxton Street) and on Jonestown Road (4637-B Jonestown Rd). If you’re looking for a mattress near Harrisburg, Mattress Warehouse has a location in Mechanicsburg (5515 Carlisle Pike) that offers all of the same quality customer service, convenience, and name brands you’ll recognize. For something with a slightly more local flare, you may want to try Whitco Home Furnishings. Whitco Home Furnishings supplies all of your bedroom needs and is a great place to take some time and shop around. They have a 50,000 square foot showroom where you’ll find the perfect mattress, box spring and pillow to meet your sleeping and budget requirements. If you are asking yourself “where can I find a mattress near Scranton?” you’re in the right place. Resnick’s Mattress Warehouse (851 Scranton Carbondale Hwy) is a great local mattress shop. You will find quality customer service, and a sales team that finds the perfect mattress to fit you and your budget. Prices are competitive when compared to larger chains. If you like supporting small businesses, Resnick Mattress Warehouse is a great option. Mattress Firm Dickson City (918 Viewmont Dr.) is a great shop if you’re looking for a mattress store near Scranton. This Mattress Firm offers quality customer service, all of the name brands you will hope to find, and a mattress that fits every type of budget.